When Samsung launches its 2019 flagship Galaxy S10 next year, it may not come with the iris scanner. Two years ago, the company had introduced the iris scanner with the Galaxy Note 7 as a new biometric authentication system, and it has made its way forward into the Galaxy S8 and Galaxy S9, apart from the Galaxy Note 8 and Galaxy Note 9. As per the latest information, Samsung could do away with the feature in the Galaxy S10. Also, the smartphone will reportedly feature an in-display fingerprint sensor as the only authentication system. One of the key reasons being speculated for the move is that Samsung wants to stretch its display further for a more bezel-less screen. 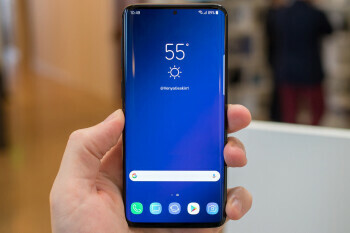 As per a report by ETNews coming out of South Korea, the primary biometric authentication technology in the Samsung Galaxy S10 will be fingerprint recognition. It says that the functionality of the fingerprint scanner will come with several upgrades over the ones present in previous models. To recall, Samsung had first introduced the iris recognition technology in the Galaxy Note 7 back in 2016. Since then, it has featured in Samsung’ Galaxy S and Galaxy Note-Series flagship handsets. Previous reports had indicated that the Galaxy S10 will come in three different variants. According to the new report, two of the handsets will feature ultrasonic in-display sensor, supplied by Qualcomm. Meanwhile, the cheaper Galaxy S10 variant is expected to ship with an optical in-display fingerprint sensor or a side-mounted sensor. As mentioned, the key reason behind Samsung’s move, as per the report, could be the company’s plan to stretching the display even more, eventually reducing the screen-to-body ratio. As per previous reports, two of the Samsung Galaxy S10 variants will sport 5.8-inch display panels, and the other one will get a 6.44-inch panel. A report had suggested that the display in one of the variants will feature a 93.4 percent screen-to-body ratio. The latest report also claims that Samsung feels the display fingerprint sensor technology has been upgraded enough to remove the need for another biometric solution.